An architect friend of mine has made effortless entertaining into a high art form. Although you wouldn’t know it on really big party days where he sweats the small details until, being a good Southern Gentleman of the old school, the last guest to arrive has been poured a drink and pointed towards the buffet. The big parties are always casually elegant affairs, with staff and bartenders to help with the 200 or so friends who descend. But my friend really shines on those days when we are invited with a few other intimates to a “casual supper.” There, the silver is always polished and waiting wrapped in starched linen napkins, the plates are stacked by the mammoth urn that serves as the salad bowl, drinks are on the drinks tray and something as simple as chicken salad never looked as elegant. Sounds tough to pull off, doesn’t it? 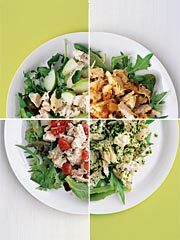 Well, polished silver aside, the chicken salad is a combination of careful shopping and good presentation. Not so much as a celery stalk is chopped in the process. So how do you pull off an afterwork casual supper for 6 or so without slaving over a wet cutting board? At out local supermarket, Ukrop’s, we are fotunate enough to have wonderful produce, both in the produce isle and at the salad bar. So, a quick trip might reveal good looking broccoli along with the chopped chicken. Care for Chicken Salad Veronique? Grab a few grapes from the fruit section. Or Oranges to mix with the chopped nuts and blue cheese sprinkles….. It’s all in the mix. About a pound of chopped chicken will serve 6 for lunch. Head home, pull out the biggest and best looking bowl you’ve got, mix the dressing in the bottom (adding salt and pepper) and toss in the ingredients. Garnish the insides of the bowl with the spinach leaves. Or serve the spinach on the side as a salad drizzled with a vinegrette. And don’t forget the basket of warmed rolls. Julip, iced tea or wine? Did you starch the napkins? This entry was posted in Entertaining, Living and tagged Entertaining, Living, lunch, recipes. Bookmark the permalink.